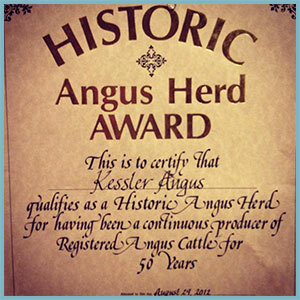 Kessler Angus is a first generation seedstock Angus operation. It was started in 1962 when Randy’s parents bought him his first heifer, Triple T Eileenmere Lassie. At 9 years old, Randy knew that he wanted to spend his life raising Angus cattle; he sold his first bull in 1964. From this humble start in the Angus business, Randy and his family have grown Kessler Angus into the over 350-head operation it is today. 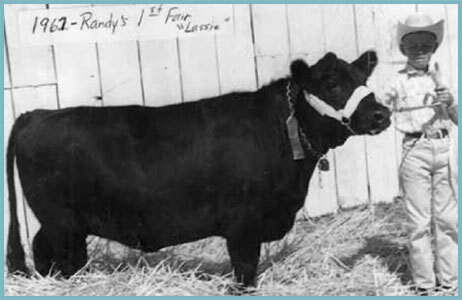 In 1969, Randy purchased his first major herd sire, P S Constructor, from Pennsylvania State University. Constructor was owned with Bon View Farms and Ohio State University. By the time he graduated high school, Randy had grown his herd to around 50 head. Throughout the years, he expanded the herd; managing them on the side while working for other operations. He used county and state fairs to expose and promote his program, eventually meeting his late wife, Dawn, at a county fair in Kennewick, Washington. In 1979, Alexander The Great was purchased at the National Western Stock Show from Sir William Farm, Hillsdale, New York, with Green Garden Angus. This sire helped shape the beginning of the Kessler herd. By the 1980s Randy and Dawn were selling 70 bulls a year through private treaty. In 1991, they began consigning to regional Angus sales. In that same year, Kesslers Rainman 002 sold for for $20,000 to Krebs Ranch at the Inland Empire Angus Association Sale in Hermiston, Oregon. 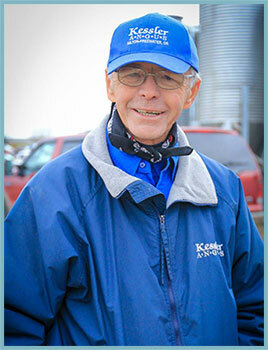 Females out of Rainman made their mark on both the Kessler and Krebs breeding programs. In 1995, Kesslers The Natural 5027 sold to Robert Koller of Pomeroy, Washington. The Natural was heavily used in both the Koller and Kessler breeding programs and sired some of the best cattle we had seen up to that point. The Natural’s dam, Kesslers Patricia 365, sold to Camas Prairie Angus and R B Cattle of Idaho. Descendants of this super donor cow can still be found in our herd. In 1998 Heritage of Donamere 1315 was purchased from Myron Lunstrum; he was owned with Stevenson Angus, Hobson, Montana. In this same year, Randy also added Camas Prairie Elba 73 to the herd. Elba went on to be a super donor cow, the Elba cow family has done great things for the Kessler program. Another consignment highlight was in 2006 when an interest in Kesslers Frontman R001 sold for a record $21,000 at the Cowman’s Classic All-Breed Bull Sale in Spokane, Washington. Frontman is now owned by Kessler Angus, Boyd Beef Cattle, Conley Cattle, Partisover Ranch, Pembrook Cattle Company, Penner Ranch, Trowbridge Angus, Southern Cattle Company, Spruce Mountain Ranch, Ray Mar Farms, and ABS Global. As the herd grew, the number of bulls merchandised per year became time-consuming and something needed to change. In 2007, Dawn finally persuaded Randy to hold the first Kessler Angus production sale. The Kesslers selected Sitz JLS Onward 517S and Sitz Onward 466S from the 2007 Sitz Angus sale. These two sires have made a great impact on the herd, with many daughters of 517S being retained as replacement heifers. In 2009, Kesslers Front Range 7520, a son of Frontman, sold to Werner Angus, Nelson Angus, and Trowbridge Angus. He went to stud at Genex and established himself as an early favorite with more calving ease and docility than his sire. In 2012, Randy received the Historic Angus Herd award from the American Angus Association, for being a continuous breeder of Angus cattle for 50 years. That year also marked the 50th consecutive year for Randy exhibiting cattle at the Walla Walla County Fair. Randy continues to expand the herd and is always in search of the next great AI and Herd Sires. In 2014, Tierra graduated from Oklahoma State University with a Bachelor’s Degree in Animal Science. She’s preparing to take on a bigger role on the operation and we’re excited to see where the next few years take us.